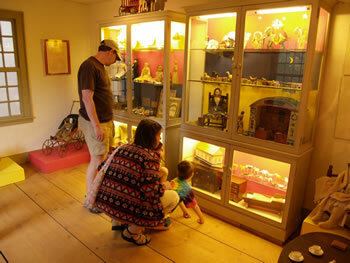 The children’s exhibit features toys and dolls from the early 19th century. In the early years of the nineteenth century, children from average families possessed few toys. Those that do survive were likely to have been made by hand. Children living in rural areas were expected to work on farms and in shops to help support their family. Schooling was sporadic and the passage from childhood to adulthood happened relatively quickly. 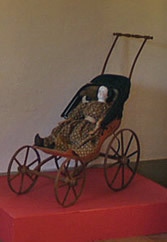 As the nineteenth century progressed, mass produced toys became plentiful for youngsters. 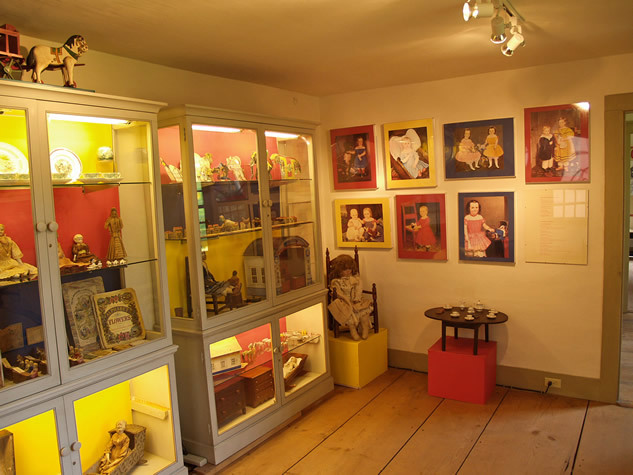 American parents were able to buy dolls, doll clothing, and elaborate doll houses. “Instructive” toys such as jigsaw puzzles, travel games, and cards were also available for purchase. Toys that could be put together and taken apart – such as card houses, dominoes, or building blocks – were popular. 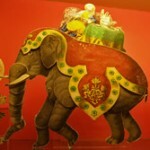 Also prized were toys that could be “used” – such as drums, musical instruments, and rocking horses. 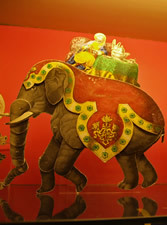 By mid-century, manufacturers began to produce a wide range of tin and iron toys, many featuring clockwork and fiction-drive mechanisms and painted surfaces in bold gleaming colors. 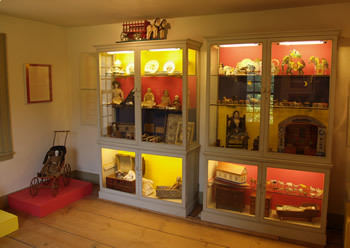 The exhibits in the toy gallery feature a wide variety of toys given to the museum by members of the National Society of The Colonial Dames of America in the State of Connecticut. 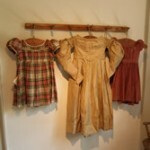 By the early 19th century, dolls and doll-related toys — such as beds, chairs, tables, cups and saucers — helped a girl imagine what her role would be when she was an adult. 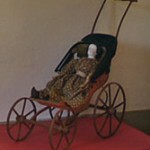 Even in the earliest Puritan settlements, children cherished their homemade dolls. Often whittled from wood by patient fathers and brothers, most of them were clumsy and stiff. Also common were rag dolls sewed and stuffed from scraps of homespun. 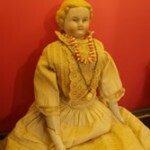 Unlike the fragile dolls made of wax or porcelain bisque, rag dolls had an enduring appeal because they could withstand being routinely cuddled, dressed and carted about. 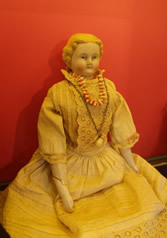 Corncob dolls were also made using the material at hand and continued in their popularity from the earliest settlements. 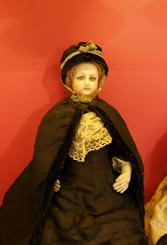 French fashion dolls were also available to wealthy American households in the late 18th and early 19th centuries. An example on on view in the exhibit is complete with trunk and wardrobe to display fashions from Paris that could be ordered or copied by fashion conscious ladies. 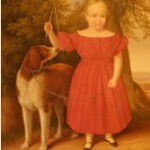 After the first quarter of the 19th century, the first German-made dolls with papier mache heads are found in America. 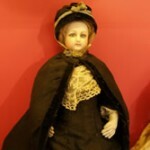 And beginning in the 1850s, mass produced dolls from Germany with heads made of white porcelain were very popular. These beauties are distinguished by their white and pink complexions and sleek painted hair. In Paris, France, starting in the 1840s, dolls made by Jumeau revolutionized the doll industry with their life-like bisque heads. They also had joints that allowed them to move like human beings. Their artistic quality was superior to anything that had yet appeared. 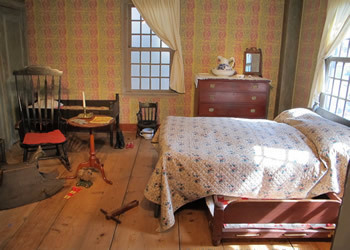 This newly reopened bedroom has been reinterpreted to reflect the sleeping arrangements of the five children who lived in the Stevens home in the 1830s. 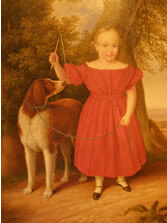 Elizabeth Stevens, whose first husband Henry died in 1825, married Captain Stephen Francis in 1828. He was a Connecticut River and Coast trader, and the descendants of their marriage (there were five children) occupied the house for 170 years until it was acquired by the Connecticut Colonial Dames in 1958. The room contains a large bed with a trundle bed that rolled underneath and a small bed with its original green paint. It was common during this period for several children to sleep in the same room and to share beds. 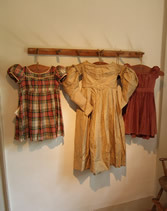 An 1825 household inventory indicates that the master or “best” bedroom was on the first floor. So it is not unlikely that this second floor room, with its paneled room end, was used by the children. The other upstairs rooms had bedsteads, but much of the space was used for storage. The original blue-green and red paint on the paneling and woodwork was uncovered when the house was restored from 1959 to 1963. 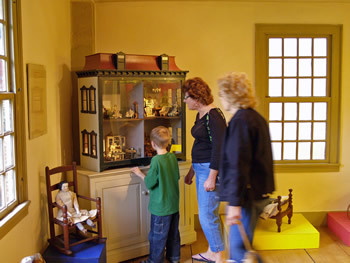 Also on exhibit in the room are 19th century bedroom furnishings, a box-type hobby horse made of pine, several painted children’s chairs, an Empire style chest of drawers made of curly maple with Sandwich glass knobs, period toys and books, and colorful quilts and textiles.